The Dragonfire Area 52 HSH Set combines the best of Alnico performance styles for your convenience. 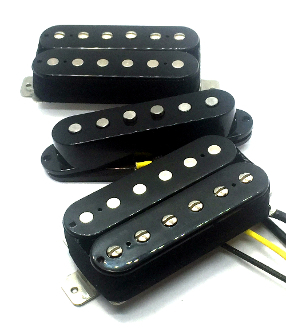 For the Humbucker bridge and neck, choose an A2 (AlNiCo II) Bucker or an A5 (AlNiCo V) Vintage Bucker. The A2 Alnico 2 Buckers can provide you with less bite than the A5 magnet style while improving mid-range performance. A5 Vintage Buckers offer warmth and clarity, strong bass and strong highs. Both humbucker styles are 4-wire and can be coil-split. For the Single Coil middle, this set features an Area 52 Single Coil Strat pickup for the multifaceted benefits of Alnico 5 magnet performance for your Bass Strings and Alnico 2 performance for your Treble Strings. Working together, the A5s boost bass performance and sound while the A2s lighten your treble and bring breath to your playing.